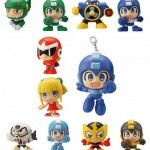 Mega House is releasing a series of mini figures based on Capcom‘s smash game series Rockman (Mega Man). The first assortment contains 12 mini figures. They are due out June 2011. Check out some photos, courtesy of Amiami (potential NSFW link) by clicking the headline of the story.